Our 2nd time at the Oval in as many days for another England 20 20 match, several performances aournd the grounds as the crowds poured in and a halftime pitch performance too ! 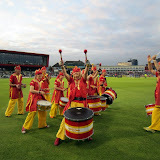 Another massive gig, playing to a packed out Old Trafford at the International t20 match between England and India. Warming the crowd up before the match, we had everyone dancing and singing along with us. Flags adorned various members as we got right up close and personal with the crowd, fantastic. Then the build up to half time after India's innings and on the pitch we go to the sound of Samba Duro and drums up in the air. Then all too quick we are whisked off as the players stream on for England's turn at the crease. Loved the crowd, the buzz and the welcome and interest we received from the fans. We even managed to get onto Sky Sports, watch out for the video shortly on YouTube. Managed to get a few shots from the day - but check out the full album at the bottom of the post.